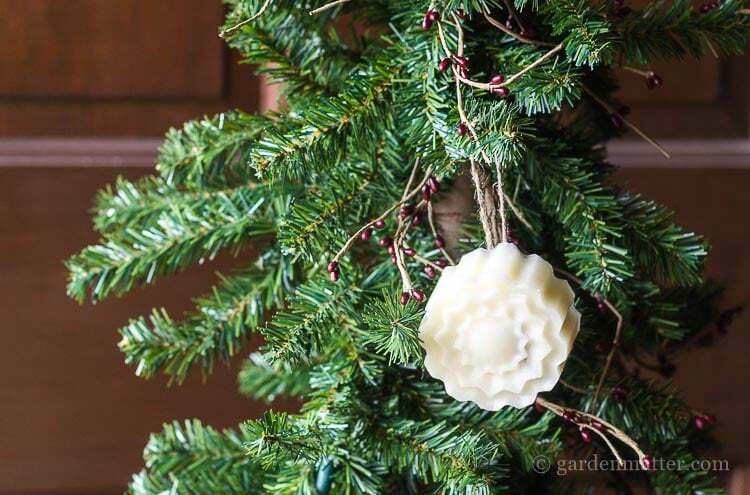 This simple tutorial shows you how to make beautifully scented beeswax ornaments. A great natural way to decorate your holiday tree. Here’s another throwback from my herbal gift shop days. In addition to the many items we sold as a retailer, we also made some of our own products, such as wreaths, and aromatherapy products. 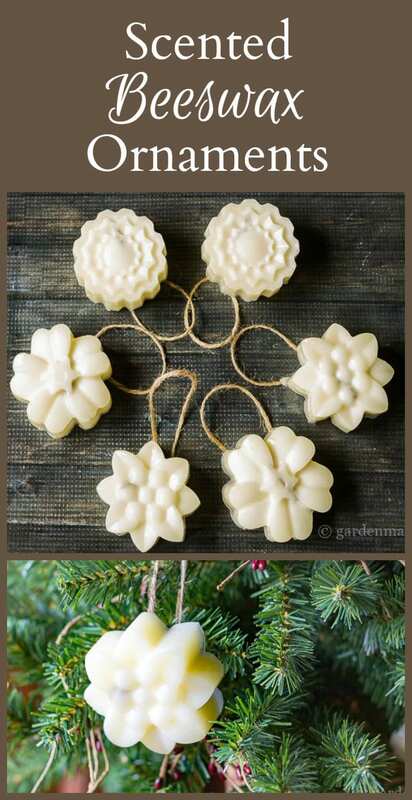 One that I remember making, were these sweet angel beeswax ornaments, with cinnamon essential oil, for a nice scent. Actually, beeswax smells really lovely on its own, so you could leave the oil out of this recipe, but cinnamon is also a really nice homey scent. I don’t know what happened to the pretty angel molds we had. They were originally sold to make soap. I looked around and found this cute cake mold in the shape of flowers, that ended up working great. To make the beeswax candle ornaments start by spraying the mold with vegetable spray. Then place a piece of nature jute twine in the molds, to act as a hanger. Melt the beeswax on the stove or in the microwave. Once it is melted, wait a minute and then add in your oils. Pour the scented wax into the molds. Keep an eye on the twine, as it may rise up. Simply put it back into place with a wooden skewer or some plastic ware. Once they have set up within an hour or so, depending on the heat and humidity of your workspace, you can remove them from the mold. Although I do like the look of the natural jute twine, it did show through a little. You can avoid this by using natural cotton twine, or even a bit of candle wicking. You can adapt this beeswax candle ornament project in several ways. Choose a different shape, like this snowflake mold. Use a different essential oil such as pine, peppermint, frankincense or myrrh. Also, there are many wonderful holiday blends of fragrance oils to choose from. Finally, you could use any type of wax, including natural beeswax, that is more yellow in color. I think they turned out beautiful and they smell wonderful too. And now I know what to make for the neighbors! Thanks! What a wonderful idea for ornaments. They look beautiful! Thanks for sharing at Snickerdoodle. Pinned to my Christmas Board. These are very cute. A great touch for a Christmas tree ornament. 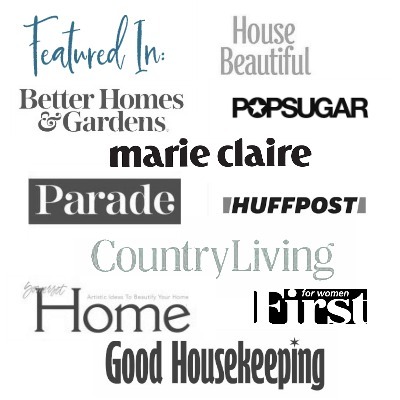 Thanks for sharing with us at Family Joy Blog Link Up Party! Yes it did take a whole pound to fill these molds, however they were pretty thick. I’m sure you can find smaller ones. Very cute for a boutique item! Thanks for sharing! These look much easier than I expected! I also love how you can choose your own scent. Thanks for sharing this. They really were easy. This mold made six and they are a nice size so I didn’t need to make a second batch. Happy Thanksgiving and have a great week. Patti, I can’t tell you how much I love this! These are simply fabulous and I always have a supply of beeswax and bottles of essential oils pellets around. I just need to get some cute molds and I’ll be all set. My daughter will love helping me and they’ll make precious gifts for friends and teachers. I think your daughter will love this project. I just wanted to say how great the silicone mold worked. They are pretty thick as you can see, but because the mold is flexible they were easy to pop out. Other materials might work fine too, I just haven’t tried them. Wow ~ these are much easier to make than I would have expected! I have a tray of apple molds that has never been used, but I think my husband and I would more than like to make apple shaped ornaments. Thank you for posting! I’m excited to try this! They are so easy and really look nice on the tree. I think your apple molds would be perfect for this project.